Researchers at Weill Cornell Medical College have successfully tested their novel anti-cocaine vaccine in primates, bringing them closer to launching human clinical trials. Their study, published online by the journal Neuropsychopharmacology, used a radiological technique to demonstrate that the anti-cocaine vaccine prevented the drug from reaching the brain and producing a dopamine-induced high. Dr. Crystal says he expects to begin human testing of the anti-cocaine vaccine within a year. Cocaine, a tiny molecule drug, works to produce feelings of pleasure because it blocks the recycling of dopamine — the so-called “pleasure” neurotransmitter — in two areas of the brain, the putamen in the forebrain and the caudate nucleus in the brain’s center. When dopamine accumulates at the nerve endings, “you get this massive flooding of dopamine and that is the feel good part of the cocaine high,” says Dr. Crystal. In their first study in animals, the researchers injected billions of their viral concoction into laboratory mice, and found a strong immune response was generated against the vaccine. Also, when the scientists extracted the antibodies produced by the mice and put them in test tubes, it gobbled up cocaine. They also saw that mice that received both the vaccine and cocaine were much less hyperactive than untreated mice given cocaine. In this study, the researchers sought to precisely define how effective the anti-cocaine vaccine is in non-human primates, who are closer in biology to humans than mice. They developed a tool to measure how much cocaine attached to the dopamine transporter, which picks up dopamine in the synapse between neurons and brings it out to be recycled. If cocaine is in the brain, it binds on to the transporter, effectively blocking the transporter from ferrying dopamine out of the synapse, keeping the neurotransmitter active to produce a drug high. In the study, the researchers attached a short-lived isotope tracer to the dopamine transporter. The activity of the tracer could be seen using positron emission tomography (PET). The tool measured how much of the tracer attached to the dopamine receptor in the presence or absence of cocaine. The PET studies showed no difference in the binding of the tracer to the dopamine transporter in vaccinated compared to unvaccinated animals if these two groups were not given cocaine. But when cocaine was given to the primates, there was a significant drop in activity of the tracer in non-vaccinated animals. That meant that without the vaccine, cocaine displaced the tracer in binding to the dopamine receptor. Previous research had shown in humans that at least 47 percent of the dopamine transporter had to be occupied by cocaine in order to produce a drug high. The researchers found, in vaccinated primates, that cocaine occupancy of the dopamine receptor was reduced to levels of less than 20 percent. “This is a direct demonstration in a large animal, using nuclear medicine technology, that we can reduce the amount of cocaine that reaches the brain sufficiently so that it is below the threshold by which you get the high,” says Dr. Crystal. When the vaccine is studied in humans, the non-toxic dopamine transporter tracer can be used to help study its effectiveness as well, he adds. 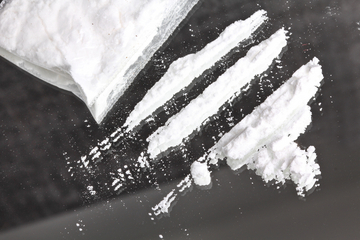 The researchers do not know how often the vaccine needs to be administered in humans to maintain its anti-cocaine effect. One vaccine lasted 13 weeks in mice and seven weeks in non-human primates. Co-authors of the study include Dr. Anat Maoz, Dr. Martin J. Hicks, Dr. Shankar Vallabhajosula, Michael Synan, Dr. Paresh J. Kothari, Dr. Jonathan P. Dyke, Dr. Douglas J. Ballon, Dr. Stephen M. Kaminsky, Dr. Bishnu P. De and Dr. Jonathan B. Rosenberg from Weill Cornell Medical College; Dr. Diana Martinez from Columbia University; and Dr. George F. Koob and Dr. Kim D. Janda from The Scripps Research Institute. The study was funded by grants from the National Institute on Drug Abuse (NIDA). Thanks to Kebmodee and Dr. Rajadhyaksha for bringing this to the attention of the It’s Interesting community. This is the second it’s interesting post of the day. I’m interested in Its Interesting but too many It’s Interesting posts makes it less interesting. From It’s Interesting member #189. Thanks and keep up the interesting work.